Salford’s 6th Education in a Changing Environment Conference, Creativity and Engagement in Higher Education has just come to an end after three amazing days full of presentations, PechuKuchas, intersting chats and encouters and lots of fun! I’ve only been to a handful of conferences but this is by far the most inspiring, exciting, modern, dynamic one I’ve attended. The amount of creativity demonstrated by the organisers and during the presentations was truly remarkable and sets the bar really high for the next one. The highlight of the three days was doubtlessly Dr Alec Couros‘ Keynote (slides / video) on “Why Networked Learning Matters“. For an hour and in a truly exciting fashion, Alec advocated “openness and connectedness” in education. He reminded of the importance for educators to position themselves as network mentors, facilitating students’ access to the vast array of open resources available out there. The greatest challenge facing HE students is not finding information, it is making sense out of it. 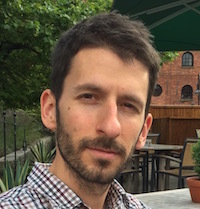 Alec explored the notion of digital identity, urging educators to present semi-public selves (Greenhow, Robelia, & Hughes, 2009) in order to connect with students to encourage them to take part in real-life interactions. 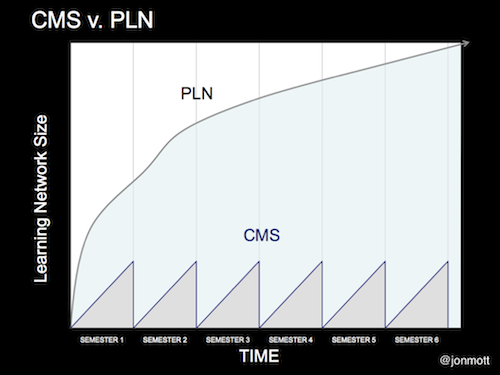 This figure represents the incremental dimension of the PLN size, in strong contrast with the ever-resetting CMS, used by so many educational institutions. This highlights one of the advantages of encouraging students to develop Personal Learning Networks rather than access and produce resources over very short periods of time (terms). This is of particular interest to me as there has been an ongoing debate in my institution on whether our newly-created Student Portal (a dedicated social networking space for our students, based on Ning) should be open or closed. I believe that the figure above illustrates better than anything else the need to provide students with an open, ongoing, free-access space for working, networking and socialising. As of today, our Ning network is still closed and offers no opportunities for our students to broadcast their content to the outer world and benefit from other people’s views and opinions. The constraints of privacy and security must be looked at with the greatest attention, but they shouldn’t prevent us from providing our students with an information-rich collaborative learning environment. Now I need to convince my institution to open up our Ning portal. Thanks for reading. Check back soon for more on ECE11.